of Shunryu Suzuki, Zen Center back then, etc. 7/30/99--from David Sunseri: I wanted to thank you for your wonderful book about Suzuki-roshi. I like many others was one of those ragged crazed hippies that used to sit at Sokoji years ago. And roshi was always so kind and warm to me. 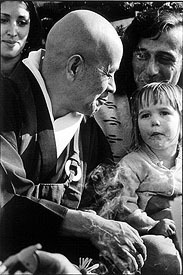 The rumor in the Haight at that time was that there was an enlightened Zen master at Sokoji, so my friends and I would drop acid or get stoned on who knows what and go over and check out Suzuki, just to see what a "real" enlightened being looked like! Even though we would stare at him, trying to see some "magic" in him, he always treated us with great patience. I also lived at Zen Center on occasion, but usually was asked to leave because I was a little too non-conformist. What I remember most about roshi was when I heard him say that everyone (including we hippies) who came to sit with him were precious to him. I never forgot that. Thanks again for writing a wonderful book and also for your website. I was sorry to hear about Dan Harvey, but Lew's recent sickness blew me away. Thanks for keeping people updated.